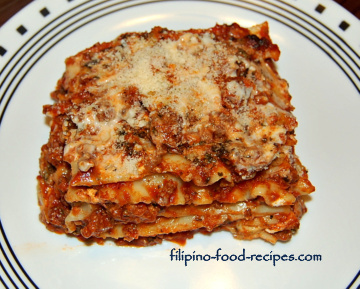 The Filipino lasagna recipe is easy to follow, and well worth all the work. It is made by making several layers of lasagna pasta, meat sauce and white sauce and topping with cheese. Not your everyday food for its tedious process and a little pricey to make, lasagna is typically served on special occasions. There are initially three cooking processes -- the pasta, the meat or bolognese sauce, the white or bechamel sauce. Finally, all three are assembled in a deep square pan or pyrex dish, then baked in the oven. Most Italian recipes use ricotta cheese instead of the bechamel sauce, but personally, I prefer the bechamel. Basically, I add cheese on my bechamel so it's called Mornay. Bechamel is just the white sauce without the cheese. Try this recipe and decide for yourself. 1 To do the bolognese sauce: saute the garlic and onion and add the ground meat and herbs. Cook until the meat are browned. 2 Add tomato sauce, tomato paste, water, salt and pepper. Bring to a boil. 3 Turn the heat down and simmer for 15-20 minutes. 4 Let's do the Bechamel sauce : Set the butter on a small deep pan and add the flour. Cook for 2-3 minutes on medium low heat. 5 Add the evaporated milk, water and nutmeg and mix until thick. Add the cheese. 6 To assemble : Spread a little meat sauce (without any meat) at the bottom of the aluminum foil pan. 7 Set a layer of lasagna noodles, followed by spreading sparingly of the bolognese sauce, and top with the white sauce. Sprinkle with about 2 tablespoons parmesan cheese. 8 Repeat the same layering process until you reach the top of the pan, or about 3-4 layers. 9 The top layer should be fully covered by the white sauce and parmesan cheese. 10 Bake on a 350 ° F preheated oven for 25 - 30 minutes. Serve hot. Make sure that no pasta is visible on top of the pan or that part will dry off during baking. For added flavor and flair, sprinkle shredded mozarella cheese on top together with the parmesan just before baking. You could prepare the dish ahead of time and refrigerate or freeze, then thaw and bake on the day you need it. No oregano or basil leaves? Replace the tomato sauce with 1 1/2 cup canned Spaghetti Sauce or bottled Ragu Pasta sauce, but the bay leaves are a must-have! No nutmeg? Just omit it in the recipe. This particular Filipino lasagna recipe yields 2 rectangular pyrex pans. You could do one on a whole pan, and a few small aluminum foil pans for freezing and later consumption. Subscribe to filipino-food-recipes.com to get access to our Recipe Index Page! and will only be used to send you updates! The Fish fillet roll or shall we say Fish fillet Cordon Bleu is simply a fish fillet rolled with ham, carrots and cheese the way cordon bleu is prepared.